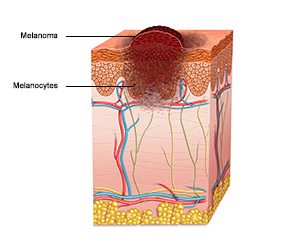 Melanoma is a type of skin cancer that starts in melanocyte cells. These cells are responsible for making melanin, the pigment that gives skin its colour. To learn more about melanoma, visit the Canadian Cancer Society. You will also find links to other organizations that provide information related to melanoma. The most important risk factor for melanoma and non-melanoma skin cancer is exposure to ultraviolet (UV) radiation. People who spend a lot of time in the sun are more likely to get melanoma than people who spend little time in the sun. Studies have shown that frequent sunburns – even if they happened years ago when you were a child or teenager – raise the risk of melanoma. People who don’t tan easily in the sun or who have fair-coloured skin or light-coloured eyes are more likely to get UV radiation damage. Although melanoma is somewhat rare among people with very dark skin, they are not immune. Melanoma can happen in people with darker skin and may be harder to find early. Even if your natural skin colour is dark, it’s important to protect yourself from UV radiation. No sunscreen can protect you 100% from UV radiation. Always use sunscreen, and wear protective clothing or find shade. Tanning equipment like tanning beds or lamps give off the same damaging UVA and UVB rays as the sun. As a result, people who use tanning equipment have at least a 20% increased risk of melanoma. In Ontario, the Skin Cancer Prevention Act (Tanning Beds), 2013 banned the sale and marketing of tanning services to people under 18 years of age. Asymmetry: if you were to draw a line through the mole or growth, the 2 halves wouldn’t match (e.g., one half is a different shape or colour than the other half). Borders: the edges are irregular, scalloped or notched. Colour: there may be a mixture of different colours, such as shades of tan, brown or black, or sometimes even white, red or blue within the same mole, sore, lump or growth. Diameter: keep an eye out for any spot that grows larger, particularly if it is bigger than 6 millimetres (about ¼ inch) in diameter. Evolving: the border, colour, elevation, shape or diameter changes or there is a new symptom such as bleeding, itching or crusting. If you notice any change or new development, consult your doctor or nurse practitioner. Some medications or products can make your skin more sensitive to the sun (photosensitivity). When you start a new prescription, over-the-counter medication or herbal remedy, read the product information and talk with your pharmacist. Ask if this product has been reported to make people more sensitive to the sun. If it has, you should be careful to protect yourself whenever you are in the sun. Transplant patients have special sun protection needs. You can learn more at the Kidney Foundation of Canada. For information about diagnostic tests for melanoma, visit the Canadian Cancer Society. To learn more about types of melanoma treatment, you can also visit the Canadian Cancer Society. If melanoma is discovered early, it may be very treatable. But unlike other skin cancers, melanoma has a much higher potential of spreading throughout the body. In 2013, 3,409 cases of melanoma were diagnosed in Ontario, making it the 7th most common cancer. There were also 519 deaths from melanoma, making it the 17th leading cause of cancer death. The rate of melanoma cases and deaths have been going up since the early 1980s. Survival is high for melanoma. People diagnosed with this cancer are 86.6% as likely to survive 5 years after diagnosis as similar people in the general population. Learn about your risk of getting melanoma – Visit My CancerIQ and get a personalized risk assessment and action plan. Find additional support info – Visit the Melanoma Network of Canada and the Save Your Skin Foundation.